Fanny Cornforth, the artist’s mistress, was the model for this striking image. The cornflowers at the front refer to her name and the passion flowers suggest her fiery character. But the image is more a hymn to beauty than a portrait. 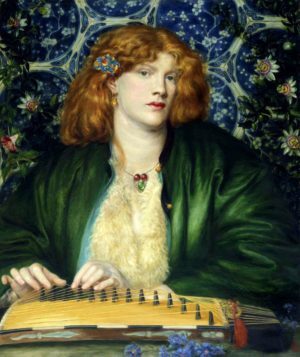 A bower is a private setting for lovers and Rossetti has decorated it with exotic elements suited to a frankly amorous encounter. The tiles combine a Chinese cherry blossom motif with an arabic shape and at the front is a Japanese stringed instrument, the koto. Everything is depicted with a Pre-Raphaelite attention to detail.